Last week, violence continued in Gaza and the West Bank, but also in the area surrounding the Sea of Galilee as Israeli forces sparred with Syrian armed groups from across the border. Within Syria itself, Islamic State (IS) militants launched several attacks in As-Sweida governorate, which were in turn met with a regime counteroffensive. This comes at a time when regime forces are making strong gains in both Dar’a and Queneitra governorates. 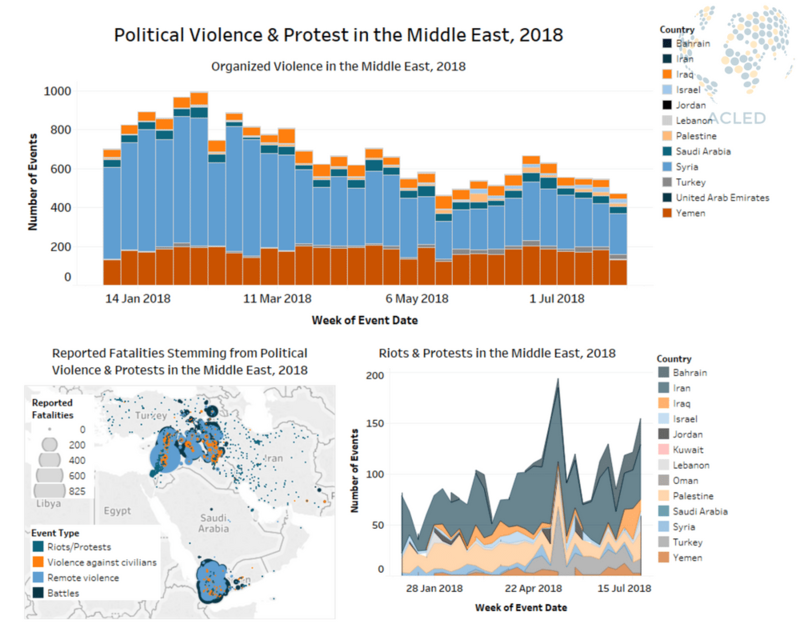 In Iraq, the anti-regime protests continued and violence surged in Erbil governorate, while in Iran mass labour strikes were renewed in response to broken promises by authorities. Finally, in Yemen clashes continued in Al Hudaydah and Al-Bayda governorates between Houthi and anti-Houthi forces, with the former allegedly targeting oil tankers in the Bab al-Mandab Strait. In Gaza, clashes between Israeli police and locals reportedly led to the death of at least four people by live fire, three of whom were teenagers. Similar clashes occurred in the West Bank, although in most cases police response was less severe with only injuries being reported. In addition, rocket and mortar fire continued along the Gaza border despite the July 21 ceasefire between Israel and Hamas. However, it appears that the majority of Israeli targets were not Hamas, but rather the unidentified groups who continue to launch makeshift incendiary devices into Israel, causing fires throughout HaDarom district. Meanwhile, the occupied Golan Heights was a tense middle ground between Israeli forces and groups within Syria. Following a July 22 Israeli airstrike on regime Defense Factories in western Hama, several attacks were made from Syria into the Golan Heights and its environs. Most importantly, Israeli forces shot down a Syrian regime warplane on July 24 as it entered Golan Heights airspace, reportedly killing the pilot. Beyond that, an unidentified attack drone was shot down on July 23, while Israeli warplanes destroyed a rocket launcher in Quneitra three days later after an unidentified group used it to fire projectiles into the Sea of Galilee. In southwest Syria, IS fighters launched several deadly surprise attacks and suicide bombings on areas in the Syrian regime-held As-Sweida governorate. Attacks on As-Sweida city, Mtuna, Dama, and other villages killed at least 255 civilians and local gunmen, the latter of whom attempted to repel the attacks. IS fighters abducted a number of civilians as well as regime forces during the fighting, later releasing a video demanding that the regime cease its operations in Dar’a’s Yarmouk Basin and exchange IS prisoners and their families for those recently abducted. However, Syrian regime forces showed no sign of capitulating to the demands as they launched several counterattacks on IS positions in As-Sweida. Regime forces also continued to clash with the IS-affiliate Khalid ibn al Walid Army in the Yarmouk Basin, making major advances towards controlling a number of key towns in the area. These clashes caused large-scale civilian displacement from the Basin as people fled towards regime-controlled areas. In Dar’a and Queneitra governorates, Syrian regime forces gained territory as they continued to battle with rebel and Islamist faction fighters. At least nine additional towns and villages, including Quneitra city, reached surrender and evacuation agreements with regime forces. This comes as evacuations from previous deals were ongoing across several governorates. Meanwhile in Iraq, massive protests continued last week against government corruption and a lack of basic services throughout the southeast and in Baghdad. However, the violence of the week prior was not repeated, possibly as a result of government actions such as the suspension of the electricity minister Qassem al-Fahdawin on July 29 (DW, July 29, 2018). In Iraqi Kurdistan, Turkish warplanes ramped up their assault on PKK positions in Erbil and Dahuk governorates, with an airstrike in the latter reportedly leaving two civilians dead. In the same area, suspected IS gunmen attacked and took control of the Erbil governorate building, taking at least one employee hostage before they were reportedly killed during an engagement with SWAT police. In Iran, nationwide labour strikes began and/or expanded last week, mostly led by truck drivers but also by employees of Iran’s Railway Services and Technical Construction Company. For the drivers at least, this round of strikes was in response to authorities not fulfilling their original promises made after weeks of labour strikes in May-June 2018. The trucker strike has spread to at least 31 cities, although one local source stated that drivers in 85 cities had joined (PMOI, July 25, 2018). Apart from the strikes, general labour protests continue throughout the country in response to general job insecurity. Finally, in Yemen, anti-Houthi forces led by the “Bayhan Brigade” began a renewed assault on Houthi positions in Malagim district of Al-Bayda governorate. Clashes and airstrikes were reported along key transportation routes in the district throughout the latter half of the week. As well, Houthi forces reportedly caused minor damages to a Saudi oil-tanker moving past the western coast of Al Hudaydah, however pro-Houthi sources claim that they had targeted a Saudi battleship (the “Dammam”). A second tanker was also targeted by Houthi forces on the same day, leading the Saudi Arabian Oil Company (ARAMCO) to halt shipments through the Bab al-Mandab strait. In Hays town, Houthi shelling reportedly led to a number of civilian deaths and prompted a protest in which locals demanded that anti-Houthi forces push them back and out of shelling range of the city. Besides this, violence between pro-Houthi forces and anti-Houthi coalition-backed forces was at a low when compared to recent weeks; the heaviest fighting occurred on the outskirts of Zabid town and Al Hudaydah port city.